This standard establishes criteria and requirements for interconnection of distributed resources (DR) with electric power systems. This standard provides a uniform standard for interconnection of distributed resources with electric power systems. It provides requirements relevant to the performance, operation, testing, safety considerations, and maintenance of the interconnection. The requirements shall be met at the point of common coupling (PCC), although the devices used to meet these requirements can be located elsewhere. This standard applies to interconnection based on the aggregate rating of all the DR units that are within the Local EPS. The functions of the interconnection system hardware and software that affect the Area EPS are required to meet this standard regardless of their location on the EPS. The stated specifications and requirements, both technical and testing, are universally needed for interconnection of DR, including synchronous machines, induction machines, or power inverters/converters, and will be sufficient for most installations. New IEEE Standard - Superseded. This standard is the first in the 1547 series of interconnection standards and is a benchmark milestone demonstrating the open consensus process for standards development. Traditionally, utility electric power systems (EPS--grid or utility grid) were not designed to accommodate active generation and storage at the distribution level. As a result, there are major issues and obstacles to an orderly transition to using and integrating distributed power resources with the grid. The lack of uniform national interconnection standards and tests for interconnection operation and certification, as well as the lack of uniform national building, electrical, and safety codes, are understood. 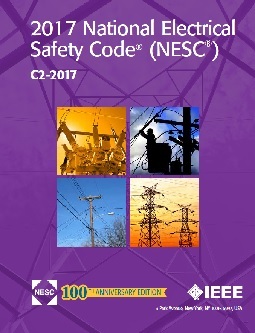 IEEE Std 1547 and its development demonstrate a model for ongoing success in establishing additional interconnection agreements, rules, and standards, on a national, regional, and state level. 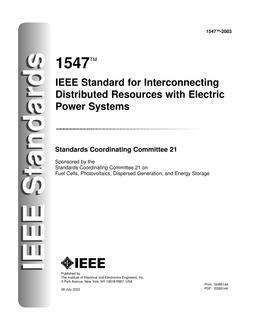 IEEE Std 1547 has the potential to be used in federal legislation and rule making and state public utilities commission (PUC) deliberations, and by over 3000 utilities in formulating technical requirements for interconnection agreements for distributed generators powering the electric grid. This standard focuses on the technical specifications for, and testing of, the interconnection itself. It provides requirements relevant to the performance, operation, testing, safety considerations, and maintenance of the interconnection. It includes general requirements, response to abnormal conditions, power quality, islanding, and test specifications and requirements for design, production, installation evaluation, commissioning, and periodic tests. The stated requirements are universally needed for interconnection of distributed resources (DR), including synchronous machines, induction machines, or power inverters/converters and will be sufficient for most installations.